Fill out quick form to start! We have cards ready for delivery in 2-3 business days for most of the 250 cities we cover! Enter your info below for more information. We contact businesses in your local community to offer awesome discounts. The discounts are printed on credit card size cards, which are reusable and typically valid for up to a year! Our cards usually sell for $10 each, you keep $5 and pay $5 for each card sold. Discounted prices are available for higher minimums and prepaid orders. No Upfront Charges/Return Unsold Cards! With our existing cards – order as many as you want, sell what you can, and return the rest. In most cases, your only commitment is to sell and pay for at least half of however many cards you order. You can return up to 50% of the total cards ordered without paying for them! After that, order more cards, then return what you don’t sell. We can also customize a card for your group, which may require a specific minimum number of cards to be sold. Our cards hold excellent local and reusable discounts. Show your card, get your discount, then keep your card and use it again next time! Friends, relatives, or co-workers live out of town? Sell them a card for the city they live in! We provide each member of your group a sales flyer free of charge that allows your group to order cards from any city that we have covered. Whether it’s the merchant on the card, the card holder, or your group, EVERYONE WINS with the Community Discount Card. Giving value while benefiting our youths and communities is a fantastic approach to fundraising and one that’s not easy to find. Please fill out form to get started. Please only apply if your group is interested in using our cards for a fundraiser. 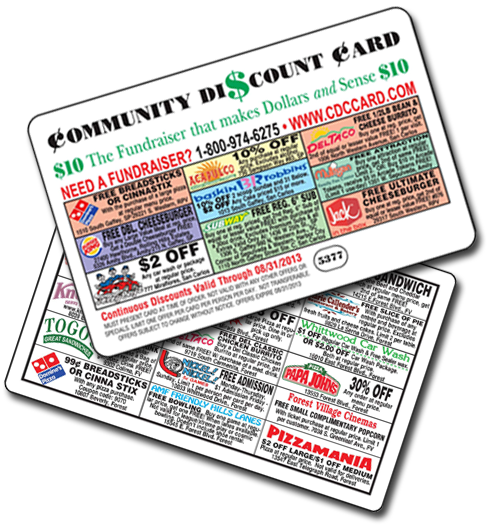 The Community Discount Card is the easiest and most successful way to raise money for all groups. Call (800) 974-6275 to get started!